Barry Finlay has turned the adventure of a lifetime into Kilimanjaro and Beyond, available on Amazon and other platforms. Barry has done book signings, presentations, and used social media – among other techniques – and shares his thoughts here. 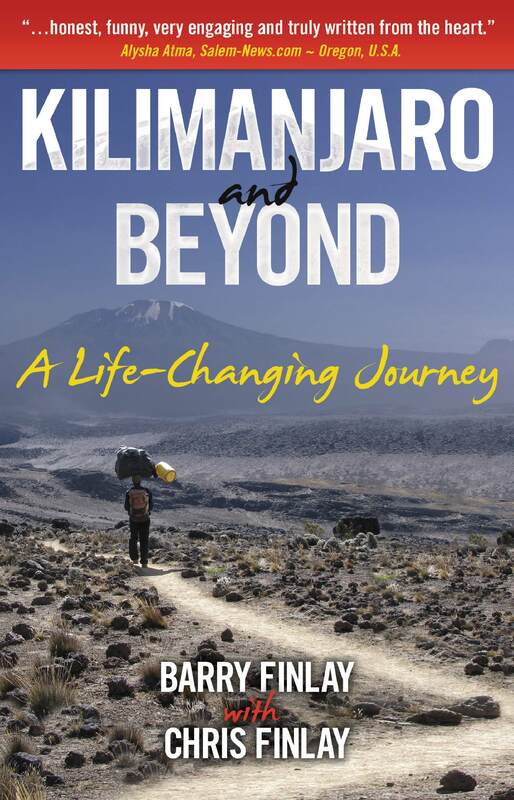 Kilimanjaro and Beyond is a true life adventure about my journey, at age 60, from the couch to a mountain top and beyond with my son. It describes the mental and physical challenges of scaling one of the world’s seven summits. But it also describes my family’s work to use the mountain as a platform to raise enough money to build a classroom and drill a well in one of Africa’s poorer communities. It is the story of the satisfaction one can achieve by helping oneself and others. Kilimanjaro and Beyond leaves us with two messages. The first is that it is never too late to pursue a dream. The second is that every mountain top we face is within reach if we just keep climbing. I realized when I started to make presentations about my journey after we returned that I had a story to tell that was interesting and inspirational for people. I decided that it was a story waiting to be written and that I wanted to write it. I have not been traditionally published. I sent a few feelers out but I really didn’t pursue it seriously after reading about other author experiences. I wanted the book to come out as soon as possible so the self-publishing route seemed to be the way to go. It has been a good experience although I think every self-published author will tell you that writing the book is the easy part. Making people aware of it is much more difficult. I have done book signings, presentations, craft markets, television, radio and newspaper interviews and as many of the social media platforms as I can handle. It is difficult to say what has been the most successful. I would say that I have sold an equal numbers of books through each type of public appearance. It is particularly difficult to assess whether the interviews and social media generate sales although some books are being sold through Amazon, Barnes and Noble, etc., so something is working. There are none yet that I have avoided or discontinued. It is a little disconcerting sitting at a book signing or craft sale twiddling your thumbs while people walk by. Eventually, one person will stop and that seems to generate interest. In the end, it is worth it. I didn’t realize it was going to take as long as it did. Once the book is done you are anxious to see the finished product. I learned that some patience is necessary. I am very happy with the product and it is getting good feedback. I can’t think of anything I would change. It is a major challenge. It is extremely time-consuming and one learns to be selective. The best advice I can give is to establish a target audience and focus on them. Marketing is a full time job. Having said that, I am getting the sense that traditional publishers don’t have the resources to put behind everyone so unless you are a well-established author, you are going to be doing a lot of the work yourself anyway. So, I guess the second piece of advice is to try to estimate the work you will have to do on marketing and then double it. I have two projects on the go. I spent much of my working life in leadership positions and I feel I have learned a lot about things you should and should not do. I am writing short essays every week related to leadership that can be found on my blog, Leadership Would Be Easy…If it Weren’t For People. My second project is a book about travelling experiences. It will be a creative non-fiction book and it has a working title of, Tales of a Traveler. I like to think that I write easy-to-read non-fiction books with a sense of humor and a message. Book reviews are available on my blog at plankilimanjaro.blogspot.com. I have an author page on Facebook. My Twitter address is www.twitter.com/Karver2. The book is available on Amazon, Barnes & Noble, and Apple. Thanks very much for the interview, Kris! Thanks for sharing your experience in self-publishing and marketing, Barry. Looking forward to hearing more about your future projects. Thanks William, I appreciate you reading!